Since 1897, only David Parkin has coached the Carlton Football Club more times than Percy Bentley. More so, few men have served the Blues longer and with greater distinction than the former Richmond champion, who steered the Navy Blues to the 1945 and 1947 Premierships, then dedicated most of the remaining years of his life to the club. Percival James Bentley was born at Castlemaine in 1906, before moving to Melbourne with his family at an early age. He grew up in Burnley, a heavy industrial area sandwiched into a bend on the Yarra River on the eastern side of inner-suburban Richmond. Young Percy was a promising footballer and an equally capable amateur boxer throughout his teens, and soon caught the eye of scouts from the Richmond Football Club. Aged 18, Percy made his debut for the Tigers in 1925. When he was appointed captain seven years later, he was regarded as one of the most accomplished ruckmen in the game. Although only 183 cm tall and 87 kg, he was fearless, durable and tenacious – qualities very much on display when he led Richmond to victory over Carlton in the 1932 Grand Final. In 1934 he took on the dual role of captain-coach at Richmond and claimed their second flag when his team routed South Melbourne by 39 points. Thereafter, the Tigers were almost constant finalists right through to the outbreak of World War 2 in 1939, but by 1940 there were people on the Richmond committee agitating for a change of coach. When Bentley asked for a 10 shilling ($1.00) raise in his weekly pay packet that year, the agitators took their opportunity and flatly refused his request. Bentley was deeply hurt by the Tiger committee’s actions, yet honoured his agreement to see out the season. He played and coached the last of his 263 games in black & yellow when Richmond were thrashed by Melbourne in the 1940 Grand Final. Only then did Percy leave Tigerland, rarely to return. Meanwhile, Carlton were hunting for a coach to replace our 1938 Premiership hero, Brighton Diggins, who had retired as Carlton’s captain-coach and volunteered for war service. Diggins himself was said to be astounded that Richmond had let Bentley go, urging the club to do all it could to get him to Princes Park. Carlton’s President, Ken Luke, and our livewire secretary Newton Chandler promptly went after their man, and were pleasantly surprised when Bentley jumped at the chance to coach the Blues. In the first of his fifteen seasons at the helm, Percy lifted his new team from fifth the previous year, to top of the ladder. Melbourne and Essendon promptly knocked the Blues out of the 1941 finals in successive weeks, but by then Bentley had shown that he was born to coach. He struck a particular rapport with the club’s younger brigade, becoming a father figure to them as they made the huge step from teenagers to league footballers. A charismatic figure, a skilled motivator and one of the real innovators of his time, Bentley was the instigator of the tactic of resting a ruckman in a forward pocket, and using a decoy full-forward to lead the opposition full-back up the ground. This allowed the ruckman to drift across the goal-mouth, and often outmark the other defenders. Long before it became mandatory, he wholeheartedly encouraged his team to use the drop-punt (especially when shooting for goal) and was an open admirer of the run-and-handball style of football favoured by Fitzroy’s legendary coach, Len Smith. In his fifth season at Carlton, Bentley wrote his name large into the history books when the Blues overcame South Melbourne in the infamous 1945 ‘Bloodbath’ Grand Final at Princes Park. Fists, elbows, knees and boots were freely used in the toughest and roughest Premiership decider of them all. Afterward, nine players were reported on a total of fifteen charges. Refusing to discuss the violence, Perce would only praise his team, saying that the Grand Final had been won by the football basics of courage, perseverance and team-work. Two years later, he collected his second flag at Carlton (and the fourth of his career) when the Blues beat Essendon in one of the closest of all Grand Final finishes. Many times during the second half of a hard, close and physical match, members of Carlton’s match committee urged Bentley to replace small forward Fred Stafford, who was having very little impact. But Perce refused, convinced that Stafford would come good - and he did. With less than a minute left in the game, Essendon was five points in front when Fred flashed past a boundary throw-in, gathered the ball, and goaled with a neat left-foot snap. It is not known whether anyone from the match committee afterward had the courtesy to describe Perce Bentley as a genius! Those two Premierships in three years were somewhat predictably, followed by a period of decline by the Blues. There were finals appearances again in 1949 and 1952, before Percy and the club decided that it was time for a change. 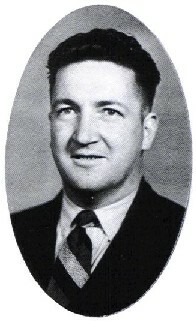 Former captain Jim Francis was appointed Carlton’s new senior coach, while Bentley was appointed to the club committee. From that time on, throughout more than quarter of a century, Percy Bentley served the Carlton Football Club with the same dedication and loyalty he had always shown throughout his playing and coaching years. With a special emphasis on recruiting, he was a long-serving committee member, Vice-President and coterie organiser. In 1965 his vote was pivotal in the decision to appoint Ron Barassi as coach of Carlton, and on January 5, 1966 - after the official ceremony to begin work on VFL Park at Waverley was completed - he cheekily produced a football and booted it downfield to claim the first kick at football’s ill-fated showpiece. Percy Bentley was still actively involved at Princes Park, displaying the same good grace and humour as always, when he was taken ill and passed away, aged 76, on March 25, 1982. In 1996, Perce was finally awarded an honour that was richly deserved and long overdue, when he was inducted into the AFL Hall of Fame. Three days before his penultimate game as Carlton coach, Perc Bentley talks about the interference in coaching matters by officials at football clubs. Contributors to this page: pblue , PatsFitztrick , blueycarlton , molsey , slow_mo , Jarusa , steve and admin . Page last modified on Thursday 20 of June, 2013 20:10:45 AEST by pblue. 1946 Rnd 11 v Essendon - Ken Baxter spoils.